“Decrease AOG and arrest revenue leakage” – That’s the strategy that has been driving investors in the aviation industry and airliners for years. Aircraft Utilization is the most significant measure of aircraft productivity. Aircraft Utilization is typically presented in block hours per day. ‘Block hours’ is the industry standard measure for aircraft utilization and ‘day’ refers to aircraft days assigned for service on air carrier routes. The number of block hours for a given flight is the time from the moment the aircraft pushes back from the departure gate, until the moment the aircraft arrives at the arrival gate. The number of block hours for an airline for a given period of time (like a year, quarter or month) is a measure of the total time that its aircraft were in use during that period. Being a Key Performance Indicator and a significant differentiator, Aircraft utilization Factor, is a function of a number of elements such as aircraft design features & characteristics, airline maintenance programs, aircraft technical reliability, airline business philosophy, market demand characteristics, and availability of trained labor. It is one of the key factors of an airline's success and profitability. 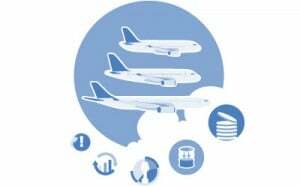 Optimizing airplane utilization, which includes efficient airplane turn-time at the gates, can help an airline maximize return on the large capital investment it has made on its airplanes. Efficient airplane utilization requires close coordination among an airline’s fleet planning, schedules planning, passenger reservations, flight operations, ground operations, and airplane maintenance systems, as well as with air traffic controllers and airport authorities. Even a small reduction in turnaround time at the gate can produce impressive benefits, particularly for short-haul carriers. For example, using the utilization/turn-time model for a point-to-point carrier (a route network where an airline focuses mainly on its origin and destination traffic) with an average turn-time of 40 minutes gives an estimated utilization level of 2,304 trips per year with an average mission length of 500 nautical miles. Reducing the average turn-time by just 10 minutes — from 40 to 30 minutes — improves the utilization level to 2,491 trips per year, which is an increase of 8.1 percent. This increased utilization allows operators to distribute fixed ownership costs over higher number of trips, effectively lowering airplane-related operating costs (AROC) when compared to hub-and-spoke carriers (a route network where an airline will plan transporting passengers between two points, and also connecting passengers between two distant cities via its hub). Increasing airplane utilization by 20 percent effectively lowers AROC by about 5 percent, a significant reduction. However, as mission lengths increase, this advantage decreases. 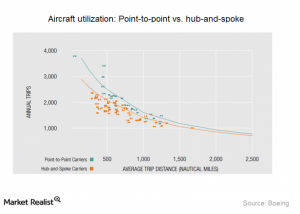 Reducing airplane turn-times means more efficient airplane utilization, particularly for airlines that emphasize point-to-point routes. Benefits of shorter turn-times are significant for shorter average trip distances. For example, a 10-minute faster average turn-time can increase airplane utilization by 8 percent and lower AROC for a typical single-aisle airplane by 2 percent. Operators who would like to take advantage of the cost savings and efficiencies of increased airplane utilization may want to start by educating their workforce about the positive effects of reducing turn-times. For example, the airline may explain that saving 10 minutes on 2,000 trips per year means an additional 20,000 minutes, or 300+ hours available for additional flights. More flights implies more paying passengers and, ultimately, more revenue. Airplane availability (or) On-time performance: The total number of days in a given period minus downtime required for airplane maintenance. Impact to Maintenance: The increase in aircraft utilization may reduce the aircraft downtime for maintenance, thereby spreading fixed annual costs for more hours and also eliminate the need for more aircraft. On the other hand, effective and time saving maintenance activities can result in better aircraft utilization. Hence a trade-off between the two can achieve the desired goal – an optimum aircraft utilization factor. While the Airline Operators & MROs work consistently towards increasing aircraft utilization by reducing downtime due to maintenance (by designing better approaches to maintenance, such as On Condition Maintenance, Continuous airworthiness maintenance programs, MSG-3 maintenance concept etc. ), the need for an optimized solution for IT-enabled aircraft maintenance services is of paramount importance. The Ramco Aviation M&E / MRO Suite, a business process-oriented web-centric Solution or On-Cloud Solution, covers a wide spectrum of maintenance operations - from maintenance planning to line, hangar, shop and engine maintenance, reliability and engineering, and technical records. The Suite has the capability to calculate the average daily aircraft utilization value of an aircraft, by tracking the journeys recorded. This enables the calculation of the forecast factor, which is significant to schedule tasks due for aircraft and component maintenance, thereby helping in planning of maintenance activities. The average utilization value is not only calculated for aircraft, but is updated right up to the last component in the assembly for which the utilization needs to be tracked. This helps in tracking the life of aircraft & component, proactively, with precision, reduce turn-around time violation by 50% and improve material planning for maintenance activities. Thus the trade-off between maintenance downtimes and aircraft utilization brings in profitability that airliners need the most – both small and large!